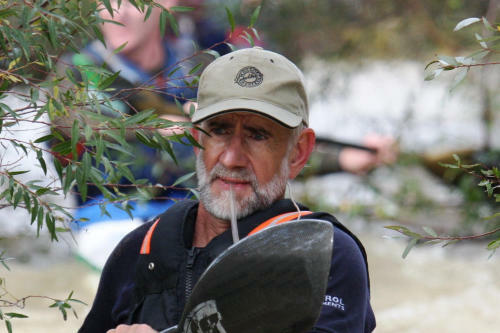 Paddlers entered for the Berg River Canoe Marathon next week are reveling in the news that the river has been flowing at its highest level in the past five years, assuring the field of good paddling conditions for the four day race from 11 to 14 July. “Even if we have no more rain before the race, we will have good water for the Berg,” said race stalwart Giel van Deventer, who has completed the tough odyssey from Paarl to the West Coast more than any other athlete. “There is more rain forecast for Tuesday – the day before the race – so we could have really good water this year. “After four tough years of low water, we are really looking forward to this year’s race,” he added. After the cold front hit the Western Cape this week, heavy rains sent the level of the Berg River soaring. “The river was running at around 100 cubic metres per second (cumecs) at the start in Paarl,” said van Deventer, who works with the Department of Water Affairs managing the water in the Berg River catchment area. “Lower down, around the Drie Heuwels weir the river flow was over 250 cumecs,” he added. The Misverstand dam has been spilling generously for over a week. Van Deventer said that the full river had done nothing to alleviate the problem of water hyacinth on the river, and if anything had aggravated it. “The river flowing compacts the hyacinth and makes it totally impenetrable,” he explained. “The race committee has made the right call to leave out the section at the start of the second day from Zonquasdrift to Gouda bridge,” he added.